Transferred from the Office of the Executive Vice President in 1991. In accordance with standing access policy, the O’Bannon papers will remain closed for twenty-five years from the date of creation. Until then, the collection is available by request only. The Executive Vice President Records are organized in the following six series: 1. Administration, 1959-1990; 2. Financial, 1983-1989; 3. Personnel, 1983-1987; 4. Speaking engagements, 1983-1988; 5. News clippings, 1983-1988; 6. Photos, slides, and video tapes. Except for the Speaking engagement series, which is arranged chronologically, each series is arranged alphabetically. The position of the Executive Vice President was created by the President F. Sheldon Hackney in 1983 under the title of Senior Vice President. The role of this person was to be the top administrative assistant to the President of the University. The title was changed to Executive Vice President in 1992. Helen B. O’Bannon was the first person to hold the title of Senior Vice President. Helen B. O’Bannon was born in Ridgeway, New Jersey, in 1939. Before her marriage, her name was Helen Bohen. She graduated from Wellesley College in 1961 with a B.A. in economics. After receiving a master’s degree from Stanford in 1962, she did advanced economic research and analysis for several federal agencies in Washington from 1963 to 1965. From 1973 to 1976, she served first as assistant dean and then as associate dean of the Carnegie Institute, where she was responsible for budget and financial affairs. Her work in that post caught the attention of Governor Milton Schapp, who appointed her as the first woman commissioner on the Pennsylvania Public Utility Commission in 1975. In 1979, Republican Governor Richard Thornburgh appointed her Secretary of Public Welfare for the Commonwealth of Pennsylvania. O’Bannon served in that post until 1983. 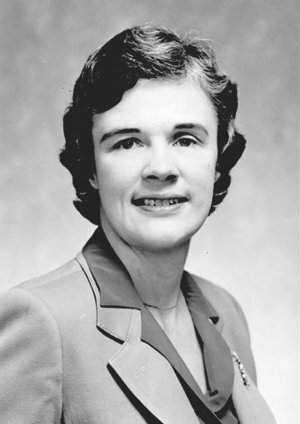 O’Bannon joined the University of Pennsylvania in the fall of 1983 and held the position of Senior Vice President until her death in October 1988. During the five years of her tenure, she reorganized the structure of the business section of the University administration. The vice-presidential areas of finance, facilities management, and human resources were significantly recast and redirected. Also under her leadership, a $90 million bond issue for long-term capital development was launched, the Penn Plan for financing undergraduate education initiated, the offices of the federal and Commonwealth relations strengthened, and the complex development project of the 3401 Walnut Street offices and shops brought to fruition. O’Bannon served at times as a lecturer at Bryn Mawr College and Chatham College, and instructor at the Robert Morris College in Pittsburgh. She was co-author of Money and Banking: Theory, Institutions and Policy, and was a contributor to Readings in Money and Finance and Women in Engineering–Beyond Recruitment. She was named a Distinguished Daughter of Pennsylvania in 1977, and received the American Association of University Women’s 1979 award for Excellence in Government and a Wellesley Alumnae Achievement Award in 1982. The Executive Vice President Records are mainly executive administrative files documenting the responsibilities and activities of the office from 1983 to 1988. The bulk of the collection is the administrative file, which is the central file of the office of the Senior Vice President and covers all major areas of the functioning of the University’s top business administrator. The series consists mainly in the form of correspondence. The Financial file includes material generated by the Academic Planning and Budget Committee and budgets either of the University generally or of specific divisions and programs within the University. The Personnel file is related to searches for the filling of various administrative positions, such as directors and vice presidents for finance, facilities management, human resources, etc. The series of Speaking Engagements includes notes prepared for dozens of occasions and full texts of two speeches. This series, together with the series of News clippings and Photos, slides, and video tapes, not directly concerned with routine administration of the office, provides an excellent insight into the personality of Helen O’Bannon. The News Clippings series consists of two parts, a folder and a scrapbook. The folder contains exclusively news clippings of appearances of O’Bannon in print media. The scrapbook, a leather-bound ring-binder created in commemoration of the 250th anniversary of Penn, holds clippings of the O’Bannon memorial service as well as clippings on various subjects which interested her. The Photos, Slides, and Video tapes series covers both personal and professional aspects of the Senior Vice President’s career. The photos consist mainly of portraits of O’Bannon. The slides are divided into four sets, one of personal and family interest, two regarding the University, and the fourth, a presentation on the functioning of women executives in state government. There are two sets of video tapes, one of the O’Bannon memorial service, the other for the promotional purpose of the University. Robert Morris College (Coraopolis, Pa.). University of Pennsylvania. Office of the Senior Vice President. Administration, Vice President, Posner, Gary J.